Transport and communications were severely disrupted. Hundreds of thousands of people fled their homes fearing aftershocks – on 12 May a second earthquake caused further devastation - and gathered in makeshift camps without proper water and sanitation facilities for weeks. Women, children, the elderly, people living with disabilities and those belonging to “lower castes” have all been disproportionately affected. Besides, the earthquake impacted employment severely. The problem of landlessness, widespread before the quake, had also worsened. In the first few days and weeks after the earthquake, our priorities were to ensure that affected people had access to adequate humanitarian assistance and to prevent the outbreak of waterborne diseases. We distributed staple food supplies, alongside rice seeds and agricultural tools for farmers. In Kathmandu Valley, we provided clean water and sanitation facilities to earthquake survivors living in some of the worst-hit districts. Our technical experts constructed water tanks and sanitation facilities in the temporary camps. Outside of Kathmandu Valley, we managed to ship vital emergency supplies to Gorkha, near the epicenter of the quake, as well as providing tarpaulins, rice, seeds, water and sanitation equipment to other hard-hit rural districts with very limited road access. We’ve been working in seven of the 14 most affected districts: Gorkha, Nuwakot, Dhading, Sindhupalchowk, Kathmandu, Lalitpur and Bhaktapur. One year on, 13,000 people displaced by the earthquake were still living in temporary camps. Therefore, we moved to a recovery and reconstruction phase to provide sustainable support in housing, as well as in water and sanitation, livelihoods and job creation. We installed waterproofed shelters and helped to protect livestock; facilitated training to vulnerable people, many women among them, to become carpenters and masons to be able to build earthquake-resilient houses; and rehabilitate damaged water supplies in schools and hill communities. We assisted people to recover their livelihoods, by restarting economic activities in the communities. We set up Cash for Work programs which provided short-term employment in the rebuilding of community services and benefited 15,000 vulnerable families. Our response contributed to creating lasting change and support vulnerable people, especially women, to be directly involved in improving their own well-being and that of their communities, helping to foster solidarity and social cohesion. Muna, 27, was nine months pregnant when the first earthquake shook Nepal and she was at the hospital when the second one occurred. Although she was left mostly alone and she was scared, the delivery went well. Muna, who lives in Sindhupalchowk province, received a bucket, hygiene kit, blankets and other emergency supplies just in the aftermath. 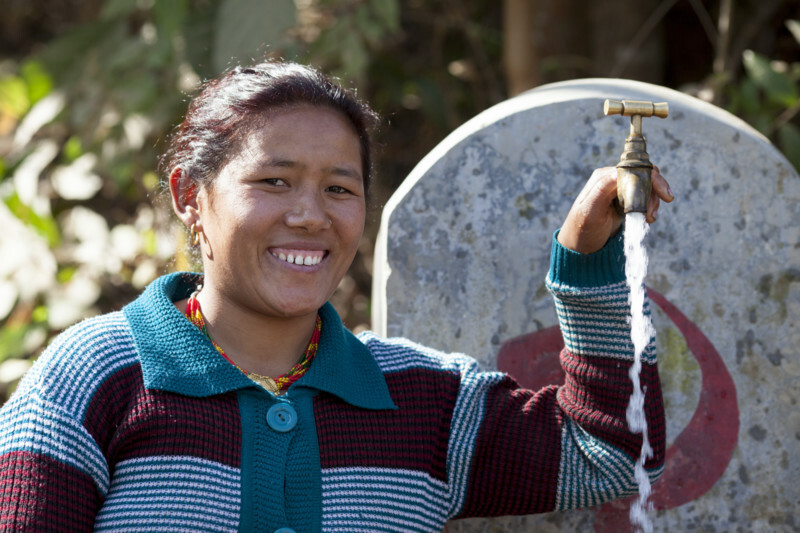 Five months after the quake, Oxfam and local partners rehabilitated the water supply system in her community and now she has access to water that is safe to drink. Apart from rehabilitating the water supply system, Oxfam supported a vegetal farming program, which has been coordinated through a women’s group. Muna is part of it. “Now we grow our own garlic, onions, tomatoes and other vegetables, so we don’t need to buy them. It is nice and I am very happy”, says Muna. Over a quarter of houses damaged by the earthquakes were owned by single women, and only a few of them had access to land titles, leaving women in danger of being excluded from the reconstruction process. To avoid this, we included them in all projects and programs, such as the masonry and carpentry training. We also organized activities through 5 different women networks to influence decision making, raise awareness about gender-based violence and girls trafficking, legal rights, citizenship, sanitation, social security and livelihoods.